The victory margin was the closest in the 21 history of the trophy with the team from Cape Town reclaiming the cup they won in 2015 by scoring just 63 points more than their arch rivals from eThekweni. The Capetonians also claimed two of the eight individual national titles at stake and provided five of the 32 finalists, earning a total of 42,840 points. eThekweni (42,777) finished runners-up with hosts and defending team champions Nelson Mandela Bay (41,792) in third place and Buffalo City (40,277) in fourth. They were followed in the team standings by Cape Winelands, Ugu, Eden, debutants Ilembe and the SA Development Academy. The 2017 edition of the national junior championships will be remembered for the incredible waves across all five days with sunshine, whales sightings, great memories and after an excellent final day a new set of champions will have their names inscribed in the annals of South Africa surfing history. Kirsty McGillivray (Nelson Mandela Bay) added another SA title to her name with her powerful and precise surfing, capturing the crown in the dying seconds of the u/18 girls final. Nina Harmse (Eden) maintained her runner-up berth from last year while goofy foot Natasha Van Greunen (Cape Winelands) finished third above her teammate Sarah Ingram in a heat with few waves. After a heat total of 19.47 in his semi final earlier in the day, Eli Beukes had unshakeable confidence in the u/16 boys final, sealing his title with a big air-reverse on his last wave. Aya Gericke (Eden) read the waves beautifully for a second place finish above Saxton Randall (eThekweni). After a rocky start Angelo Faulkner (Nelson Mandela Bay) went for broke with a huge aerial manoeuvre but was unable to stick the landing and had to settle for fourth place. The talented u/16 girls had a slow final but Nelson Mandela Bay surfer and J-Bay local Kai Woolf knew just the right waves to pick to claim another SA title with her ferocious backhand attack. Runner-up S’nenhlanhla Makhubu (eThekweni) was a good match for Woolf on her backhand and held the highest single score in the final, an 8.5, but struggled to find a heat winning back up ride. 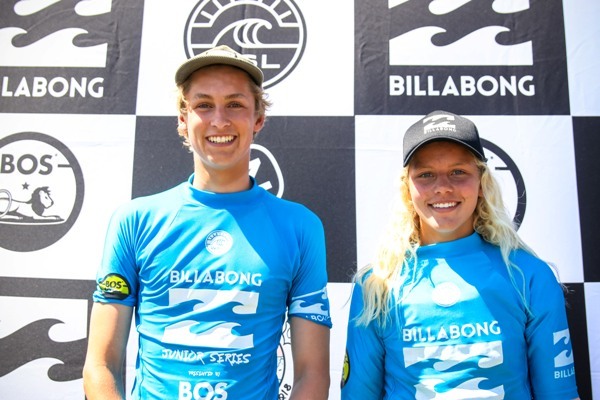 Tayla De Coning (Buffalo City) was narrowly bumped to third place with Summer Sutton (Cape Town Surfriders) finishing fourth. The u/14 boys were blowing up throughout the contest but in the end it was Buffalo City’s Mitch Du Preez who claimed his first SA title with a total of 16.44, despite only surfing three waves in the 20 minute final. Teammate Daniel Emslie finished close behind in second place ahead of Luke Thompson (eThekweni) and Kye Macgregor (Nelson Mandela Bay). The u/12 groms were a pleasure to watch as they fearlessly charged the overhead waves. In the girls final Gabbi Herbst (eThekweni) held the lead with a series of great scores while Scarlette Van Jaarsveldt (Cape Town Surfriders) earned a well warranted second place in her first SA champs. In third was Nelson Mandela Bay rider Zia Hendricks and in fourth was Maya Figl (Cape Winelands). The charismatic Kyra Bennie (Cape Winelands) was chaired from the water’s edge to the podium by his teammates after taking out the u/12 boys’ title. Nate Colby (eThekweni), who on Saturday scored the only perfect ten-point ride of the contest, finished runner-up while Ethan Currin (Buffalo City) edged into third place ahead of River Gericke (Eden). There were a number of specialty awards at stake with newly crowned SA U16 boys’ champ Eli Beukes (Cape Town Surfriders) claiming both the BOS Highest Heat Score and the VonZipper Airshow prizes. The Wazoogles Surfer of the Event for Boys went to Nate Colby (eThekweni) and for Girls to Caroline Brown (Cape Town Surfriders). The Skull Candy Loud & Proud trophy for the team displaying the best spirit throughout the five-day event went to the enthusiastic team from Ugu on the KZN South Coast. As part of Surfing South Africa’s commitment to transformation, the South African Development Academy team participated in the event thanks to support from Sea Harvest and a grant from Sport and Recreation South Africa. The penultimate day of the 2017 Billabong SA Champs presented by BOS saw the semi-finalists decided in another action packed day of excellent, rippable surf at the Point in Jeffrey’s Bay on Saturday. The beach was alive with cheers from the various district teams as they got behind their teammates, knowing that a spot on finals day will be valuable to their team standings. Those still in contention are a step closer to a coveted South African junior surfing title and a place in the record books. The U18 boy’s quarterfinals were a blur of high quality surfing that saw seasoned competitors Ford Van Jaarsveldt (Cape Town Surfriders) and Adin Masencamp (Cape Winelands) shred their way to the semis along with Koby Oberholzer (eThekweni), Joshe Faulkner (Nelson Mandela Bay), Ethan Fletcher (Cape Town Surfriders) and Nathan Wallace (eThekweni). Zoe Steyn (Buffalo City) once again dominated on her backhand in the U14 girls’ quarterfinals whilst dark-horse Jesse Powell (Ugu) managed to eliminate former SA champ Kayla Nogueira (eThekweni) in a major upset. Lhea Johnston (Buffalo City) and Ceara Knight (Cape Winelands) will be joining Cape Town Surfriders teammates Caroline Brown and Katie Winter on the final day of competition. The fact that five near perfect high nine-point rides have been posted in the U16 girls division demonstrates the high level of surfing. Kai Woolf (Nelson Mandela Bay) and Julia Ploughman (Cape Town Surfriders) were the first semi finalists to be decided before S’nenhlanhla Makhubu (eThekweni) began her heat with a near-perfect 9.83 and left the rest of the heat in combination. Joining them in the semi finals will be Tayla De Coning (Buffalo City), Summer Sutton (Cape Town Surfriders), Juliet Fliet (Cape Winelands) and eThekweni team members Gabi Lailvaux and Olivia Izzard. A slight onshore wind and increase in swell gave the U18 girls had plenty to work with. Nelson Mandela Bay’s Kirsty McGillivray, Kelly Medley and Zoe Smith were right at home in their backyard and soared their way to the semi’s. Eden ladies Taghiti Gerick and Nina Harmse will be in action in the semi’s too alongside Cape Wineland surfers Sarah Ingram and Natasha Van Greunen. The U12 girls put on another gutsy performance in their Round 2 match-ups. Gabi Herbst (eThekweni) and Maya Figl (Cape Winelands) surfed their way to the semi finals. A change in schedule saw the girls hit the water again at the end of the day. Scarlette Van Jaarsveldt (Cape Town Surfriders) advanced to the final with Herbst. Zia Hendricks (Nelson Mandela Bay) and Figl both dropped excellent scores in the second semi and will be in the mix for the title. The U14 boys displayed some excellent and precise surfing and it was the on form eThekweni members Nate Spalding and Luke Thompson who progressed with Kye Macgregor (Nelson Mandela Bay), Brad Scott (Cape Town Surfriders) and Buffalo City surfers Daniel Emslie and Mitch Du Preez. The semi finals for the U16 boys could each be a final! Semi 1 will be Angelo Faulkner (Nelson Mandela Bay), Saxton Randall (eThekweni) and Cape Town Surfriders Max Elkington and Luke Slijpen while Semi 2 will be just as exciting with Tide Lee Ireland (eThekweni), Aya Gericke (Eden), Bryce Du Preez (Buffalo City) and Eli Beukes (Cape Town Surfriders). To end off the day the U12 boys’ finalists were decided. Kyra Bennie (Cape Winelands), Nate Colby (eThekweni), who posted the first perfect 10 point ride of the event, River Gericke (Eden) and Ethan Currin (Buffalo City) will be battling out for the SA title on Sunday. Organisers are expecting a slight bump in swell size and offshore winds for tomorrow’s final day as the country’s top juniors compete for individual titles in U12, U14, U16 and U18 boys and girls divisions, while earning points towards the coveted Freedom Cup that goes to the district whose team accumulate the highest total. 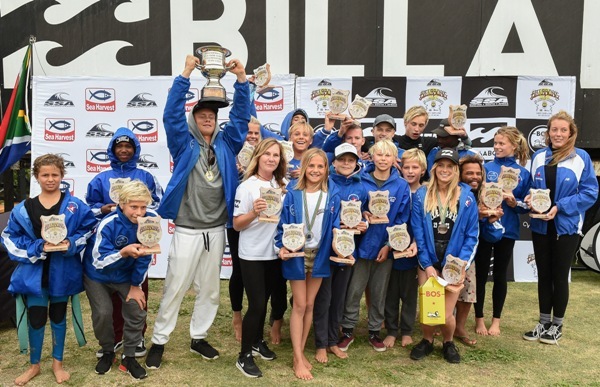 There are also a number of specialty awards at stake including the BOS Highest Heat Score, VonZipper Airshow and the Wazoogles Surfer of the Event for Boys and Girls, while the team displaying the best spirit throughout the five-day event receives the prized Loud & Proud trophy. As part of Surfing South Africa’s commitment to transformation, the South African Development Academy team is participating thanks to support from Sea Harvest and a grant from Sport and Recreation South Africa. 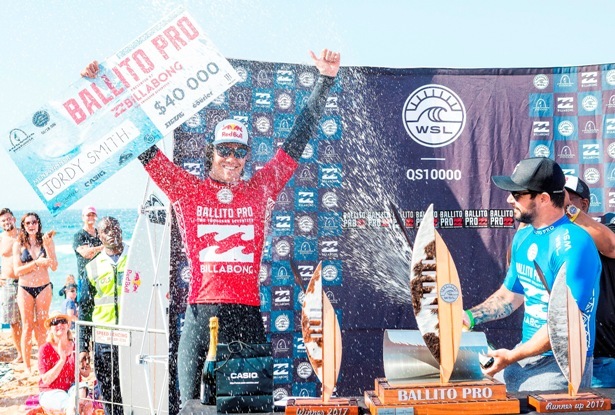 The Billabong SA Champs pres. 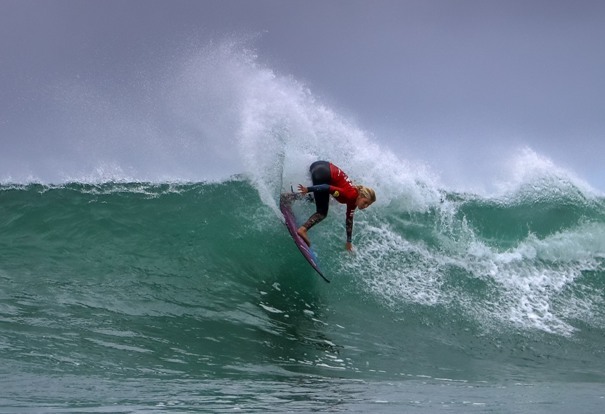 by BOS continued to prove its wave magnet status as the Lower Point at Jeffreys Bay continued to produce epic surf on Day 3 as the country’s top 18-and-under surfers revelling in the long rides while battling for national titles and invaluable team points. It was an early start for Round 3 of the U16 boys and Angelo Faulkner (Nelson Mandela Bay) wasted no time in dropping an excellent score on his way to the quarterfinals. 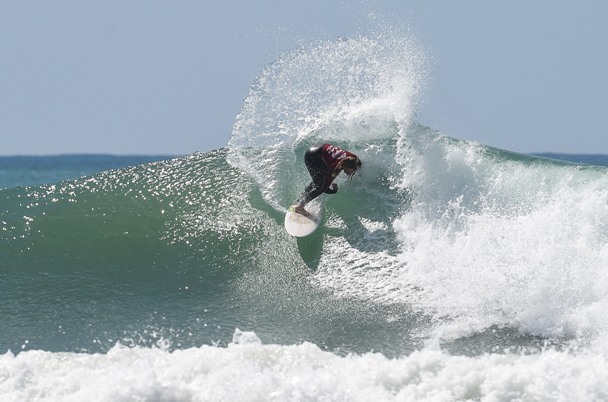 Cape Town Surfriders Eli Beukes and Max Elkington once again proved that J-Bay suits their stylish and powerful surfing by finishing their heats with 17-point totals. The U14 boys Round 3 were next to surf and eThekweni team members Luke Thompson, James Ribbink and Nate Spalding all found places in the quarterfinals, where they were joined by Mitch Du Preez (Buffalo City) who surfed with maturity far beyond his age. The extremely competitive U18 boys Round 3 was exciting to watch as Luke Malherbe (Buffalo City) and Koby Obelholzer (eThekweni) put on electric performances in their encounters. Adin Masencamp (Cape Winelands) used his carving rail game to collect a series of high scores and earn a comfortable heat win as he eyes a second successive title after winning the U17 boys crown last year.. The first round of the U12 girls paddled out and charged what for them were overhead waves with plenty of style. Lisa Van Heerden (Nelson Mandela Bay) racked up a really impressive 18.10 heat total with her smooth surfing while her teammate Zia Hendricks was another standout. 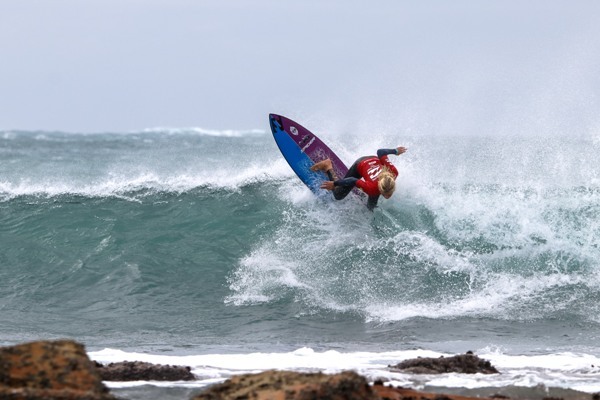 Scarlette Van Jaarsveldt (Cape Town Surfriders) is showing the same talent as her brothers Ford and York have displayed as she too made it to the semifinals of her division. The Repercharge rounds for those who did not finish in the top 2 in their opening heats started with theU16 girls. Kelly Fenton from host district Nelson Mandela Bay drew clean lines on the open wave faces and progressed to the quarterfinals along with Rentia Tromp (Cape Winelands), Claire Haskins (Ugu) and Hannah Moerdyk (Buffalo City). The U18 girls were amped to have their turn in the pumping surf with Caitlin October (Cape Town Surfriders) and Carla Van Wyk (Buffalo City) the first to advance to the quarters with finesse. Nelson Mandela Bay girls Zoe Smith and Kelly Medley then dominated the next heat and will be action again tomorrow. The day’s action again finished off with the U12 boys where Joel Fowles (Buffalo City) and Ben Ribbink (eThekweni) navigated the high tide to advance to the quarterfinals along with Ntokozo Maphumulo (SA Development Academy Team) and Josh Van Wyk (Cape Town Surfriders). More swell and light winds are forecast for Jeffreys Bay over the weekend as the country’s top juniors compete for individual titles in U12, U14, U16 and U18 boys and girls divisions, while earning points towards the coveted Freedom Cup that goes to the district whose team accumulate the highest total. Luke Malherbe (Buffalo City) was on fire on his backhand, finding a couple of the day’s biggest waves and producing a near-perfect nine point ride. That was matched by Kody Oberholzer (eThekweni) who used his entire repertoire of forehand manoeuvres on the long J-Bay walls. By midday the onshore wind was freshening but J-Bay’s perfect geography ensured running waves for the surfers in the cutthroat 15 minute repercharge round heats. Aya Gericke (Eden) and Tye Findlay (Buffalo City) were impressive in moving through to Round 3 of the U16 boys, while Matt O Brian (Buffalo City) and Declan Fiet (Cape Winelands) were among those who will compete in the next round of the U14 boys. The U14 girls showed style and grace in their Round 2 encounters with Jess Powell (Ugu) and Chanel Shaw (Eden) advancing after a great heat. And the U12 boys wrapped up a long day with Joel Fowles (Buffalo City), Josh Van Wyk (Cape Town Surfriders), Ben Ribbink (eThekweni) and Ntokozo Maphumulo (Development Team) all stoked to progress to Round 3. There are also a number of specialty awards up for grabs including the BOS Highest Heat Score, VonZipper Airshow and the Wazoogles Surfer of the Event for Boys and Girls, while the teams compete for the prized Spirit Cup.